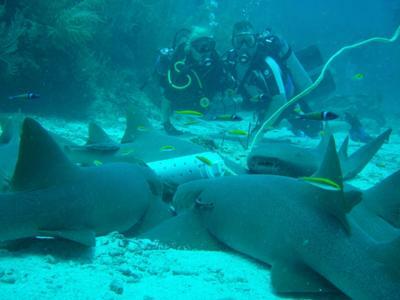 I would like to tell you about our first scuba diving trip to Ambergris Caye, Belize. It was the first of many dive trips there - I hope! Travel & Arrival: Our flight wasn't too bad, 3 hours from LAX to DFW, then about an hour delay, and then 3 hours from DFW to BZE. We arrived later than planned, due to the delay in Dallas, but Tropic Air put us on the next flight to San Pedro no problem. Our package with Blue Tang included the flight, and we were really glad we only had a 20 minute flight versus an hour and a half boat ride. When we landed in San Pedro, we just took a taxi to the hotel, they had told us ahead of time that they would cover the taxi fare, so that was really nice too. When we got to the hotel, Allan was still there waiting for us to check us in (the office normally closes at 5, and we got there at 6). We stayed in room #14, which is a "garden view" room on the 3rd floor. We really liked it though. It was on the quiet side of the building, and to see the ocean, you just had to open the door. The rooms are small, but clean, and have a full kitchen, which was a huge bonus. The A/C works great, I love having hardwood floors, and the 3rd floor rooms have jacuzzi bathtubs, which we never used, but it would have been nice. The rooms are pretty bright in the morning, so bring an eye mask! The swimming pool is small, but we only jumped in a few times between diving. Breakfast is just some kind of pancakes or french toast, cereal, fruit, juice, and coffee; but that was just fine with me, as I don't like to eat a lot before diving. Allan was very helpful at the front desk, and helped us to make any reservations we needed. All in all, I was very pleased with the hotel, it's cute, small, not noisy, at the north end of town, and had everything we needed. The first night we were starving, so we just walked along the beach until we found someplace open for dinner. We ended up at Lily's Treasure Chest, which was good, just more expensive than I was expecting. Then, we walked further into town, and found the town square. We had a few drinks at Jaguar's dance club, and did some people watching from the deck. Diving: We dove all 5 days with Chuck & Robbie's. They're just about 100 meters down the beach from Blue Tang, and they were awesome! The airline had lost our dive bag, so they got us all set up with some rental gear for the first day, and everything was in really good shape. The water was a bit choppy that day, but the DMs were very attentive and patient with us on our first dive. I'm always a little skittish on my first dive, especially after I had a bad experience last year in Catalina, but they were great. A typical dive day was: show up at the dive shop around 8:30, load up and leave around 9, boat-ride for 5-10 minutes, multi-level dive, with a max depth of 80-90 feet, and we usually stayed down for about 45 minutes. They let people stay down longer if they still had air, so some people were down for 30 minutes, others were down for 50 or so. The boat was always close by, and picked us up as soon as we surfaced. Then, we'd head back to the dive shop for about an hour, and since our hotel was so close, we'd go back to the room to have a little snack. air. The boats were never too crowded, and one day there was just 3 of us. The DMs were very professional, attentive, and treated us like we were friends, rather than just customers. They would show us all the cool stuff that we would have missed on our own, and even took some cool pics for us, that we wouldn't have otherwise gotten. We saw lots of turtles, all the normal Caribbean fish, some stingrays, some spotted eagle rays, eels, pufferfish, and on the last day tons of nurse sharks. Robbie was there every morning, greeting and talking to people, and making sure that we had everything we needed. Enrique & Giovanni were the DMs, and they were both awesome. I highly recommend this dive shop, and plan to dive with them again when we go back. Other trips: We only had 2 free days during our trip, so on the first day we took the water taxi to the mainland, rented a car, and went to the zoo. It's a super easy drive, and well worth it. The zoo was very cool, I definitely recommend it. If you make it there early enough, you can even head over to Xunantunich, or some of the surrounding cities to eat, drink, or shop. We made it back to the water taxi in time to make the 4:30 trip back to Ambergris. Our other big trip was to Lamanai. We did the trip through Reef Adventures & Searious. The boat picks you up at 7am, takes you to the mainland, then you take a very bumpy, long bus ride, and then take another boat down the river and through the jungle to finally get to Lamanai. In all, it was around a 3-4 hour trip to get there. Once there, we had lunch, then a guided tour through the site. Then, back on the boats & bus to get back. I was told there are other tour operators that will fly you to the mainland, and then you just take one boat trip, which I think would have been better, but we still had fun. The site is very cool, only 4 temples have been excavated, but they are still very impressive. I would only recommend climbing the "high temple," because it took all of my strength to just do that one temple, and you don't want to miss that view. We also got to see the resident howler monkeys, and all kinds of cool flowers and plants. It rained on us for about 20 minutes, but it was actually pretty nice to cool down. Other stuff: On Wednesday night, we did the silly "chicken-drop" at the Spindrift hotel, which was hilarious. We were there during the Costa Maya festival, so the one of the beauty queens shook the chicken and threw him in for the first chicken drop. I bet on 20 squares, but still didn't win! It was fun though. We also went over to Caye Caulker one afternoon after diving. We caught the 2:30 water taxi, got there, had lunch, a few drinks, did some shopping, and walked down the whole island until "the split." Then we made it onto the 5:30 water taxi back! I would definitely recommend heading over to Caye Caulker for an afternoon, just to see it, but there wasn't much that would have held my attention for more than a day. It was an awesome trip, and we hope to go back soon!